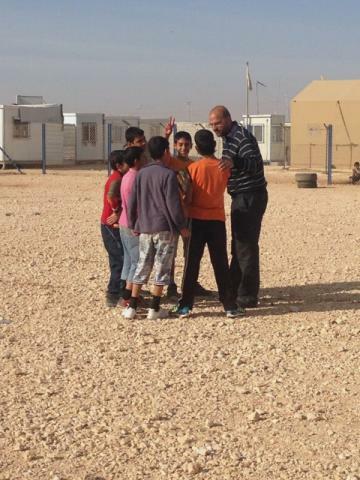 In the spring, Questscope hosted communications workshops in Jordan’s Zaatari refugee camp through the MeWe Syria initiative. Our Syrian mentors and case coordinators learned about video production as a way to use communication to break down barriers and share the stories of triumph, resilience and hope that they see happening around them. Approximately 98 percent of children in the United States stood on the curbside waiting for the school bus this year. There’s the five-year-old girl starting kindergarten. She takes that first step onto the bus, with dreams of becoming a teacher. Her future holds endless opportunity. There’s the mother that watches her. As her daughter takes that first step onto the bus, she beams with pride thinking of her future. What will she learn? Who will she become? The words of Nabil, a 12-year-old Syrian refugee, tell the story of a life abruptly interrupted. Nabil fled his home with his mother, father and four siblings three years after the outbreak of conflict in Syria. His eyes fixed on the past and feet planted in the emptiness of the present—it seemed impossible for him to walk forward. "The point is, art never stopped a war and never got anybody a job. That was never its function. Art cannot change events. But it can change people. It can affect people so that they are changed because people are changed by art—enriched, ennobled, encouraged—they then act in a way that may affect the course of events, by the way they vote, the way they behave, the way they think." In partnership with UNOCHA, Questcope recently completed a pilot mentoring program for youth at risk of violent behavior in Jordan's Za'atari refugee camp. UNOCHA recently reported on the program in the July update for the Syria Emergency Response Fund. The full report is available here. In 2012 Questscope launched One2One, its first mentoring program in the United States. One2One adapted Questscope’s time-tested model to fit within North View Junior High (NVJH) in Brooklyn Park, Minnesota. Since then, the program has tripled in size. Nearly 85 students were connected with mentoring relationships with trusted adults from a local community college during the 2013/14 school year. Sufia stole from her classmates in school. Amer led a gang of boys in throwing stones at passing cars. Hani was caught spray-painting caravans.